Cats need their teeth brushed just like everyone else. A sugar-free diet doesn't mean your kitty isn't at risk for gum disease and tooth loss. Leaving plaque to build up and ignoring her dental health can lead to stinky breath, pain, and problems with eating. The key to dental health is reducing tartar with home and professional care. Brush your cat's teeth with a toothpaste designed specifically for use in cats. Choose a small cat toothbrush, or use gauze on your finger if your cat doesn't like the feel of a brush. Brush every day if possible, or a minimum of twice each week. Use an oral rinse to reduce bacteria in your cat's mouth, which will improve bad breath and help prevent tartar formation. Rinses are available online and in most pet stores. Just a rinse or two each week will make your kitty more kissable. Feed your furry friend a diet designed to promote dental health. Some cat foods contain ingredients meant to reduce tartar and scrape plaque from the teeth. If your cat has special dietary needs, consult your veterinarian before changing her diet. Give your cat dental chews instead of standard snacks. These chews benefit the teeth by scraping food and plaque from the surface of teeth during chewing. Plus, they come in many tasty flavors. Low-calorie chews are available for overweight cats. Offer your cat chew toys. These toys strengthen your cat's teeth and can help remove soft tartar, according to the ASPCA. Look for toys made for cats; dog toys are often too hard and too large. 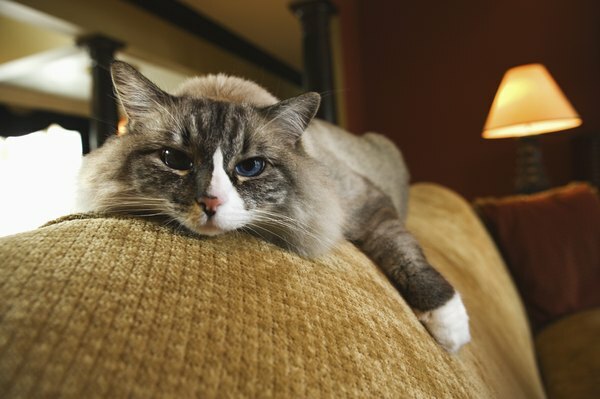 Take your cat to the vet every six months for a professional cleaning to reduce tartar buildup. Your veterinarian will examine her teeth for signs of damage and gum disease and suggest other needed care. Never use human toothpaste on your cat's teeth. It can make your cat sick. Can Cats Have Different Colored Gums? Do Dental Rinses for Cats Really Work?